Feel great and confident using Set Wet long lasting perfume sprays.Stay fresh, cool and dry all day using these amazing Set Wet perfume sprays in different variants to pick from. Set Wet Cool Avatar Deo is a breezy fragrance with a fresh breath of mint and ginger, woody under tones, a whiff of musk and a trail of vetiver. You are the king of sun and sand. The sporty one, who's up for anything. You enter and the beach comes alive. You play ball. You pull off stunts on water. And of course, are tagged in every beach selfie. Make Set Wet your ally. You avatar is Cool Avatar. 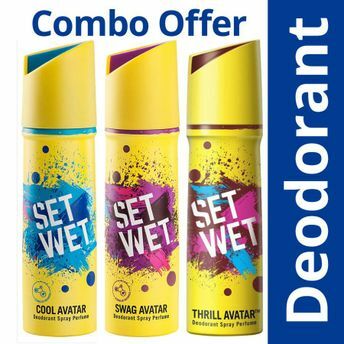 Set Wet Swag Avatar Deo is a fresh fragrance with a strong note of patchouli and sandalwood, a crisp citrus burst and a subtle hint of grapefruit. You are the ray of sunshine on a dull day. The mad energy that wakes up boring lectures. You are bright, even OMG sometimes. But that only makes you the class favourite. And the reason no one ever bunks class. Make Set Wet your seat partner. Your avatar is Swag Avatar. Set Wet Thrill Avatar Deo is a fresh blast of citrus and mint, it's a fragrance that blends aromatic whiffs of lavender with a touch of cedar wood and leather back notes.You are a live wire. The life of the party, who doesn't wait for the song to kick in. You groove to the beat of your own drum. Your mind has a rhythm of its own. And your moves, they catch on like a fever. Make Set Wet your dancing partner. You avatar is Thrill Avatar.